Need some extra income? You've come to the right place! Explore the various ways you can earn extra cash, plus specific skills and stuff you can sell — as well as some business ventures you can operate on the side. Use these links to jump to any section. The evolution of the Internet has drastically changed the world that we live in. Luckily, all these changes present tremendous opportunities for business and new ways of making money! Is it really possible to make money for online surveys? Yes. There are lots of reputable marketing companies that run valuable research for major brand companies, and that compensate you for your time. Linsey Knerls reveals the tips and tricks to be a sweeper, winning prizes and cash for a little time and dedication. When you search for work at home opportunities on the internet, oftentimes you will find sites pitching programs that could make you thousands of dollars a week. Usually these programs are scams designed to take your money. So how do you go about finding legitimate work at home jobs? There are countless ways to raise your income, besides the obvious one of getting a job. These are more "turn your hobbies into a job" type posts, and I don't suppose that they are all viable for everyone, but with a little creativity, they can be parlayed into part-time gigs. 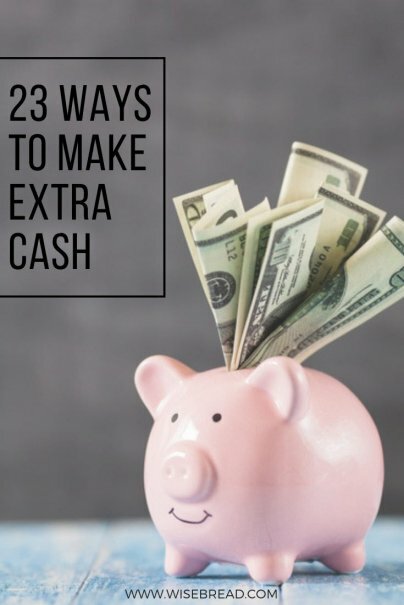 None of these will make you independently wealthy or even allow you to quit your day job (unless you get a serious dose of luck along with your ingenuity), but they just might let you get enough cash to fund something special. There is a legitimate way for you to feed your addiction for bestsellers and box office blockbusters without spending a dime. Here's how you can go from your average bookworm or movie watcher to a supercharged, reviewing machine. Both private and public universities now have online degree programs — some were/are traditional brick and mortar institutions while others are predominantly online. If you do a search for schools to teach for online you’ll find a great many of them available. Do you have an area of expertise and a desire for some extra income? Are you good with concepts and do you like to work with students from elementary school to post-graduate levels? If so, you might have an opportunity to make some money on the side (or even full-time) from the comfort of your home. Most hobbies offer you a shot at any number of income streams. And, besides actual income streams, there are also ways to use your hobby to reduce expenses--which any economist will tell you is just as good. Wouldn't it be more exciting to make some extra cash while learning something useful that could make you a more valuable employee? Website usability testing may be the route for you. Here are the pros and cons of earning from your own website or blog. Here are some off-the-wall commodities that you didn't know you could get cash for. Tired of getting a small $7 credit (or perhaps no credit at all) for curbside recycling in your city? Or perhaps you have old broken cell phones, laptops, or even golf balls laying around? Here are 15 websites that actually pay you to recycle your old stuff. How do you determine what's hot and what's not? Here are a few tips to help you sort through the real junk and those items which have much more value than the sentimental kind. The hair trade just seems like such an archaic idea, but actually high quality hairpieces are still made from real human hair and there is a huge market for sourcing natural hair. Here are some tips and information on how to sell your tresses for cash. Although they are beautiful trees, some homeowners find palm trees to be a nuisance because they require routine maintenance when they get too large. The good news for these homeowners is that it is possible that their trees could be sold for hundreds to thousands of dollars. For little to no start-up costs, you, too, can be your own boss and have the option of working in your pajamas! Curious as to how you can make money selling used books? Here is a quick guide to how you can start your own used book business from the comfort of your home. Wise Bread blogger Julie Rains spoke with seasoned camp directors about how they turned summer weeks into extra income. Here's a road map for a summer camp business. As a small business owner there will be various tasks for which you’ll be responsible and can seem overwhelming, at times. But, there are a few simple guidelines you can follow to make your time worth more. The Key to Making Money Online? Diversification, Baby! Just as diversification can help balance your investments, it can also help balance your income. And for those of you hoping to make a living online, balance is definitely key.